The Red Arrows will fly to North America following their last UK show of the season at the Royal International Air Tattoo (RIAT), which ends on 21st July. They will fly via Scotland, Iceland and Greenland and are due to arrive in Canada on 8th August. The deployment, called ‘Western Hawk 19’ will be the first time the Red Arrows have visited America since 2008 and their first major North American tour for 26 years. Previous tours, which include China, Greece, Jordan, Saudi Arabia, Kuwait, Qatar, Oman, Pakistan and Bahrain, have led to the UK gaining as much as ten times as much in sales and investments as the tour cost. This table is based on location information supplied by the Red Arrows and official government news releases. The dates have not been confirmed by the Red Arrows. We have added them based on published show dates. The first of the venues for Red Arrows displays were released on 8th February. They are listed in the table and illustrated in the map, which is taken from the Government news release. More venues will be announced in the coming weeks. There is no mention of joint flypasts, but there are several opportunities. 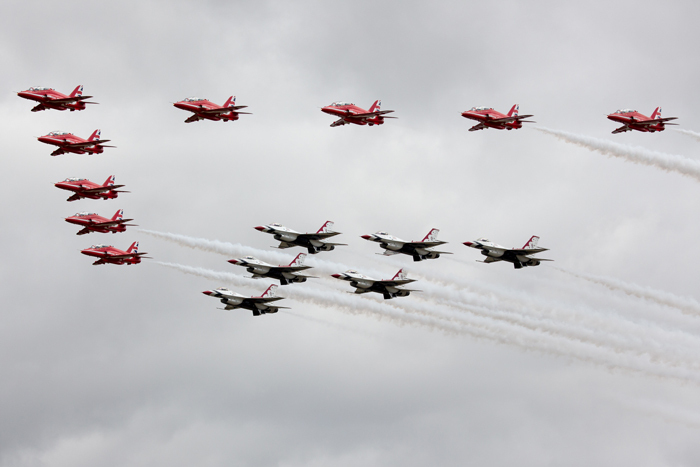 The American and Canadian national teams have already announced their display schedules so it is known that the Thunderbirds will be at the same show in Atlantic City; the Snowbirds in Toronto and Los Angeles and the Blue Angels in Chicago, New York and St. Louis. The Red Arrows left the UK on 14th September 2017 on 'Exercise Eastern Hawk': a tour of the Middle East lasting nearly five weeks, returning on October 14th. 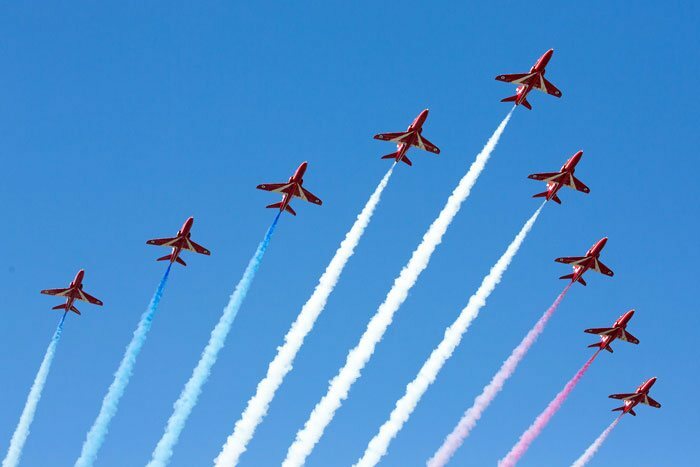 When in Kuwait earlier in the year, Defence Secretary Sir Michael Fallon announced that the Red Arrows would display in that country as part of a wider regional tour, with a programme that will promote the United Kingdom’s long-standing relations across the Gulf. "This historic Red Arrows tour will be a visible demonstration of UK engagement across the globe, flying the flag to promote Britain in important capitals through the GREAT campaign. Kuwait is a vital partner. I will be looking to strengthen our military relationship with more frequent joint exercises ..."
One of the most spectacular elements of the tour was on Saturday September 23rd, when the Red Arrows were given the freedom of the airspace over Jordan and below 3,000ft for an hour. During that time they flew the length of Jordan, completing a series of flypasts over the Dead Sea and some of the country’s historic landmarks, including the famous carved temples of Petra, watched by some of the Jordanian royal family as well as tourists. The following day they moved on to Saudi Arabia where they displayed over Jeddah on Monday 25th. Their last full display was on Sunday 8th October in Bahrain, over Karbabad Beach but there were later flypasts over Saudi Arabia and Athens (and Lincoln City football ground) en route back to their Scampton home, which they reached on 14th October. The team visited 11 nations including Kuwait, Jordan, Saudi Arabia, Kuwait, Qatar, Oman, Pakistan and Bahrain. The information comes from a press release issued by the UK Ministry of Defence (click the blue text to see the full press release) and the Twitter feeds of the Red Arrows, their individual pilots and technicians. There is also a summary on the Red Arrows web site, published after their final display. The government says that, at a time when the UK is negotiating a new, deep and special partnership with the European Union, it is continuing to look outwards globally. One of the purposes of the tour was to highlight the partnership with the British Armed Forces in each nation visited, as well as demonstrating that the UK is ‘open for business’, committed to peace and security, and a leading player on the global stage. The Ministry of Defence said that the Red Arrows tour allowed for further close cooperation with Kuwaiti and regional armed forces and promote opportunities for investment and trade with the UK, encourage government-to-government engagement to develop economic partnership, and showcase the excellence of STEM education with UK universities. The Red Arrows left the UK on 29th September 2016 to perform displays or flypasts in 12 countries from the Middle East to the Asia-Pacific. They returned after covering 19,772 miles through 18 countries. 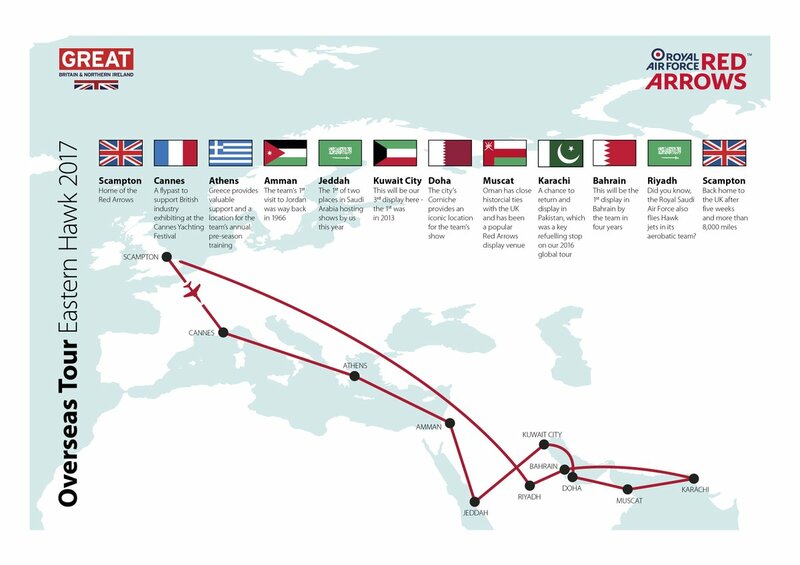 The total trip was 19,772 miles through 18 countries with 41 refuel stops. The Defence Secretary, Michael Fallon, announced back in July that the RAF’s display team will perform their world-famous aerobatics with displays and flypasts for the first time ever in China, and to perform in other countries including India, Malaysia and Singapore. There is information about the tours on the Red Arrows web site and on Twitter using #RedArrowsTour. The tour followed an invitation for the Royal Air Force aerobatic team to perform at the Zhuhai Airshow as part of the UK’s GREAT campaign. At Zhuhai the Red Arrows performed 9 displays in 6 days. The Strategic Defence and Security Review made clear the UK’s commitment to the Asia Pacific region and to building relationships to "address global challenges". Following visits to Japan in January and Singapore in May, Mr Fallon confirmed that RAF Typhoon jets will take part in the joint exercise Bersama Lima from Malaysia, which forms part of the UK’s commitment to the Five Power Defence Arrangements (FPDA). October 13 Singapore Flypast not possible due to weather. Flypast rearranged for 18th October. October 14 Malaysia Kuala Lumpur - Flypast with Typhoon not possible because weather en route delayed arrival. Finally arrived in Malaysia 15th October (Local time). Flypast rearranged for 18th October. November 11 Thailand Hua Hin - Displays and flypasts. Complete. The general details in this article are taken from two government press releases and the Red Arrows web site. The Press release on the Red Arrows tour is here and the Government's release on the Typhoon tour is here. 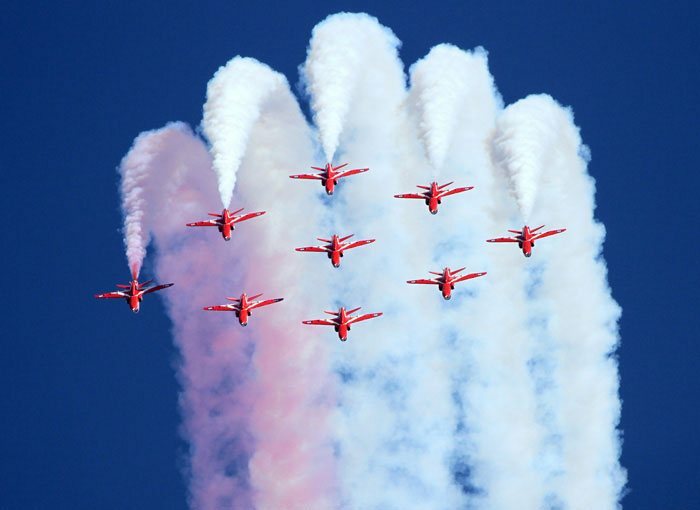 The Red Arrows tour date list and map are here. The updates to the timetable are taken from the Twitter accounts of various Red Arrows pilots and engineers and from the British Embassies and Consulates in the respective countries. The Five Power Defence Arrangements are a series of defence relationships established by multi-lateral agreements between the United Kingdom, Australia, New Zealand, Malaysia and Singapore signed in 1971, whereby the five powers are to consult each other ’immediately” in the event or threat of an armed attack on Malaysia or Singapore for the purpose of deciding what measures should be taken jointly or separately in response. The Typhoon was able to flypast in Kuala Lumpur on 14th October, even though the Red Arrows were weather-bound and could not get there. Typhoons then landed in Japan for joint exercises. Exercise Bersama Lima is a Five Power Defence Arrangements exercise held in the South China Sea, Malaysia and Singapore. The aim of the exercise: to enhance interoperability and strengthen the professional relationships of FPDA nations by conducting maritime, land and air operations in a simulated multi-threat environment. Map of the tour. First published on the Red Arrows web site.